Apple is the target of a new lawsuit that claims employees of the company's Upper West Side store in New York City told two black men they were not welcome there. 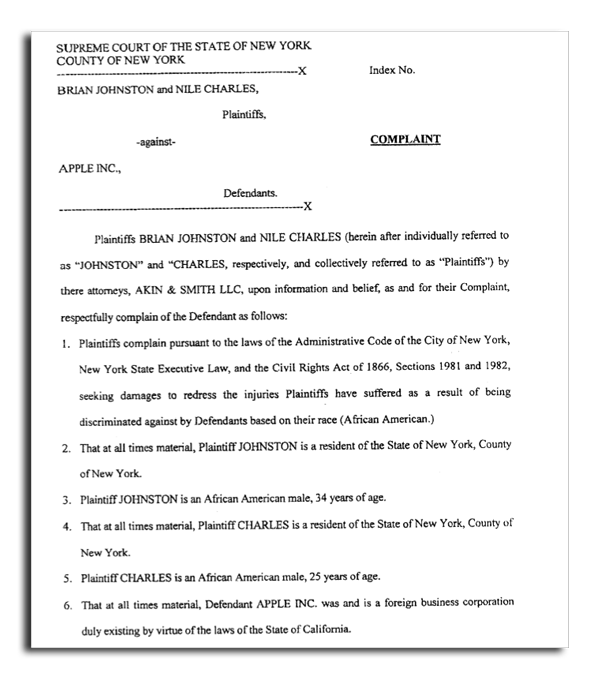 Plaintiffs Brian Johnston, 34, and Nile Charles, 25, have accused Apple of discrimination after an incident they claim occurred on Dec. 9, 2010. Both Johnston and Charles went to the store at 1981 Broadway when the incident allegedly began with an Apple employee, said to be white and in his 50s. The lawsuit notes that Charles and Johnston, who are black, went to the Broadway Apple store wearing "baggy jeans and large sweaters with hoods" to purchase headphones. It was around 3:20 p.m., they claim, that the Apple employee, about 6-foot-2 and 225 pounds, confronted them. The lawsuit alleges that the Apple employee approached the customers in an "intimidating fashion," invading their "personal space," and said to them, "You know the deal. You know the deal." The employee allegedly told the plaintiffs that they must leave the store unless they planned to purchase something or see a Mac Specialist. Johnston and Charles claim that before they could respond, the Apple employee told them they were not welcome there because of their race. "And before you say I'm racially discriminating against you, let me stop you. I am discriminating against you," the lawsuit claims the employee said. "I don't want 'your kind' hanging out in the store." Johnston and Charles say they were "shocked and humiliated" by the alleged incident. They reportedly used their cell phones to record the confrontation when they say another Apple Store employee approached them. "Now you have to go," one of the employees is claimed in the lawsuit to have said. "If you want to know why, it's because I said so. CONSIDER ME GOD. You have to go." Johnston and Charles said they asked to speak to a manager, but the store's head of security ignored their request. They reportedly found a manager on their own, and made allegations of racial profiling. "In order to further harass, degrade, humiliate, and discriminate against Plaintiffs, the manager asked Defendant's Head of Security to call 911," the complaint reads. "Defendant interfered with Plaintiffs right to purchase personal property because of their race." The lawsuit was filed earlier this year in February in New York Supreme Court. The filing came to light this month after the case was moved to U.S. District Court in the Southern District of New York. The lawsuit accuses Apple of discrimination under both New York and federal civil rights laws. The plaintiffs seek punitive damages, and originally argued that those damages exceed the jurisdictional amounts of all lower courts. They assert they are entitled to damages due to ongoing "emotional pain, suffering, inconvenience, loss of enjoyment of life, and other non-pecuniary losses." The Upper West Side store where the incident allegedly took place opened in late 2009. It features a unique curved glass roof and glass front. Late last year, a separate lawsuit against Apple accused one of its retail stores in Orlando, Fla., of age discrimination. The plaintiff in that case, a man in his 60s, was an employee of the store who claims he was denied promotions because of his age.